When it comes to Cantonese food, one of our favorite destinations is New World Hotel’s Jasmine. It’s the default destination for quiet dinners commemorating milestones like birthdays and graduations. Our own wedding, while held at one of the hotel’s ballrooms, featured a menu that was culled from Jasmine’s offerings. We love them that much. Still, I kept putting off writing about them, figuring there’s always a next time. Well, at this rate, I’ll never get to it, so perhaps now is a good time. We usually start off with dimsum. Pretty ordinary, yes, but Jasmine elevates the usual hargao and shomai into something quite unforgettable. 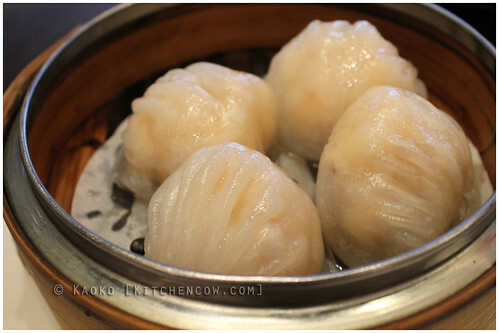 The shrimp dumplings are bursting with shrimpy goodness, as evinced by whole shrimps (no extenders here), tenderly enveloped by a delicate dough. 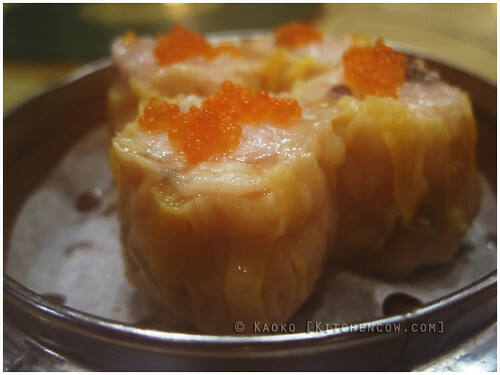 The shomai presents a delicate mix of firm, meaty pork and earthy mushroom, finished with little exploding bits of fish roe. Their shomai easily raises the bar for best shomai you’ve ever tasted. 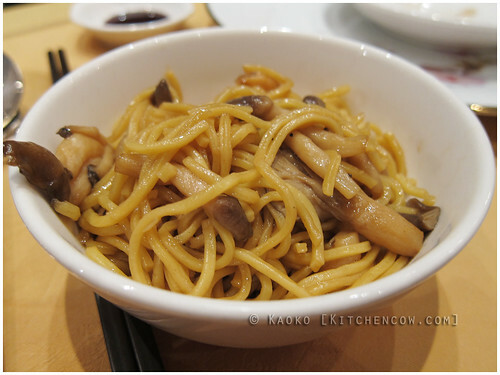 Following the tradition of partaking of noodles to wish a birthday celebrator long life, we usually go for e-fu noodles. This traditional birthday noodle is loaded with mushrooms (shimeji, I think) and crab meat, making a surprisingly flavorful dish despite its seeming simplicity. Like fish? I do, too! 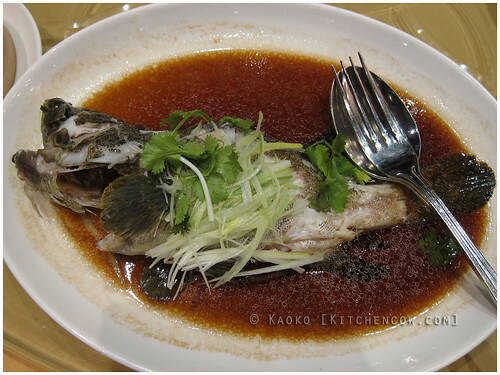 And my absolute favorite is their Steamed Garoupa. The freshest lapu-lapu is doused in a delicately flavored soy base sauce, complimenting the fish’s natural sweetness rather than masking it. Shredded onions make a refreshing bite, heightening the flavors even more. It’s the kind of fish dish that’ll have your cats hating you for picking the bones all too clean. Another Jasmine staple for us is their Beef with XO sauce. 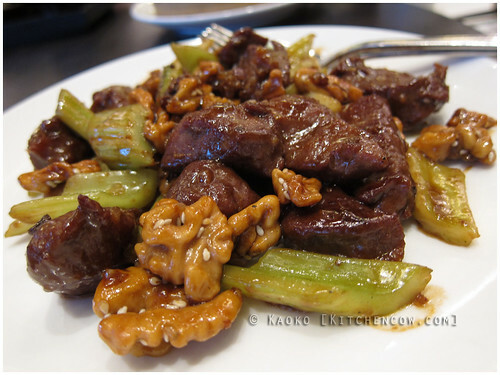 This stir-fry puts together tender, prime cuts of beef, crunchy celery and shelled walnuts sprinkled with sesame seeds in a very flavorful XO sauce, for a distinct taste and texture that melds the savory beef, refreshing celery and crunchy walnuts. 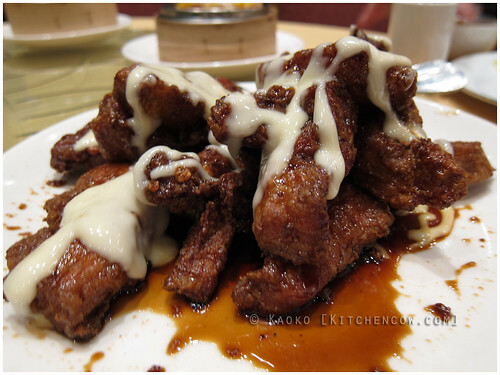 If you love spare ribs, the Fried Pork Spare Ribs with Changkong Sauce is an interesting take on the Cantonese staple. Extremely tender, fried spare ribs are doused in a sweet, sticky, vinegary changkong vinegar sauce, then drizzled with a creamy mayo-based sauce. What you get is an intense flavor explosion, that usually leaves me sated after one piece. Spareribs with Changkong Sauce, I give up! Fruit meets seafood in a matchless pairing in the Mango-Prawn salad. Plump shrimp that’s breaded and fried are tossed with sweet, ripe mango slices in a mayo-based dressing. I confess though, I actually enjoy eating this with rice, instead of as a salad as the name suggests. So inelegant, I know, but so so sooooo good! 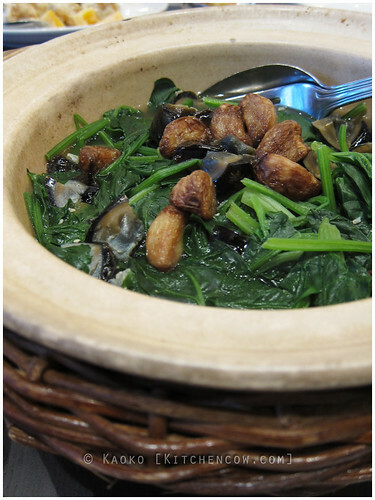 During our most recent meal, the chef recommended the Chinese Spinach cooked in a clay pot when we were looking for soup ideas. This soupy dish had chinese spinach, whole roasted garlic, and bits of century egg in a lightly flavored broth. It’s a great way to give your taste buds a small reprieve after the richness of the pork and the beef. Of course, like most Pinoys, we can’t enjoy a proper meal without rice. For us, it has always been (and probably always will be) Yang Chow Fried Rice. What I love best about their Yang Chow is the smokey flavor enveloping the rice. 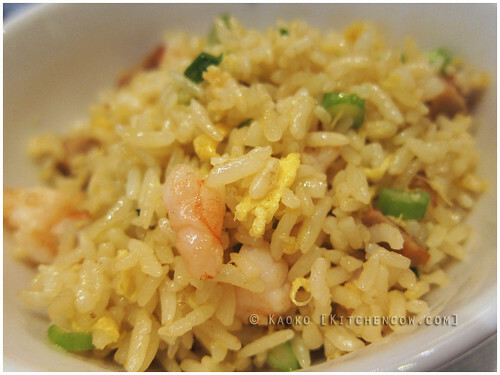 Yang Chao Fried Rice – Classic Pinoy, right? If you’re still not stuffed, there’s always dessert to complete the experience. Our must-have dessert favorite is the Mango Pudding. 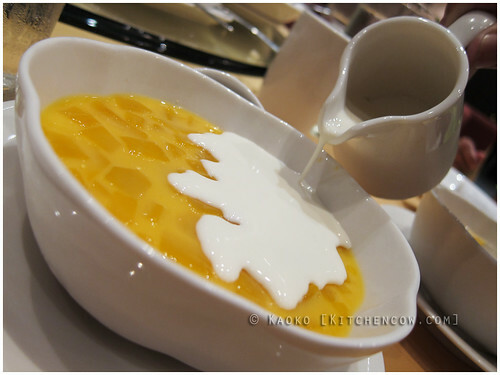 A fruity mango pudding studded with mango cubes, we enjoy dousing this dessert with lots of milk to up the creaminess. It’s our one non-negotiable when dining at Jasmine. And I know of some people who were clamoring for seconds when this was served during our wedding lunch. 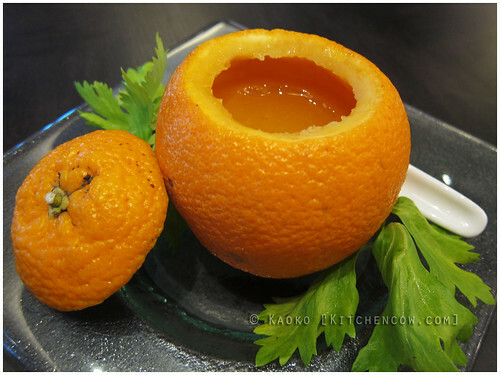 Aside from the mango pudding, Jasmine also has a signature orange jelly dessert, served inside a hollowed-out orange. We’re told that each orange dessert uses up to eight fresh oranges’ worth of juice, so you can imagine how packed with flavor this is. 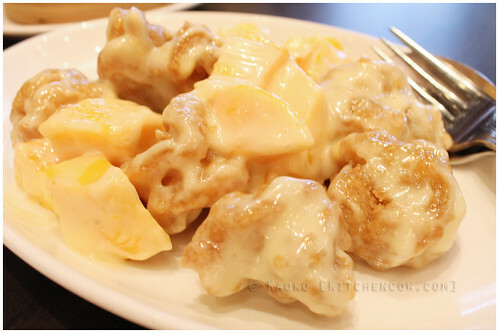 It’s a very interesting and refreshing dessert, but admittedly, our hearts already belong to the Mango Pudding. With this rundown, you can easily imagine the many happy, memorable meals we’ve had at Jasmine. Dining here doesn’t only make a special occasion more memorable, but it has made ordinary days quite special, too. Perhaps the best thing to do is to try it yourself to understand why it’s a great place to get your Cantonese fix. Not to mention your memorable meal fix, too. Disclosure: My mother-in-law works for New World Hotel, allowing us to avail of an employee discount when dining. Nevertheless, all meals are paid for and all opinions are the author’s own. wow! those really look mouthwatering. 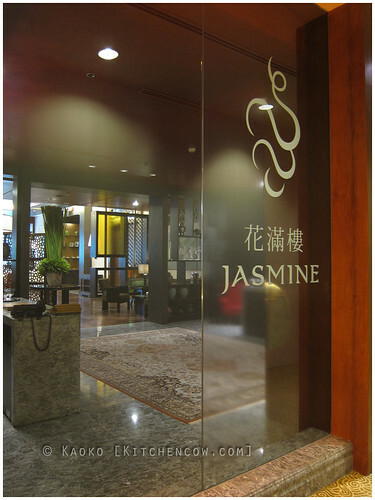 i want to eat at Jasmine!!! Ooooh… those dumplings look divine! I have to try this out in New World! Very! I swear, tumaas ang standards ko sa shomai dahil sa kanya. How pricey is Jazmine resto? Usual hotel meal prices, but the servings are pretty generous. IIRC, the dishes are priced from 300 upwards, depending on what’s in the dish. I only discovered Jasmine last year but I also love it! Love their pork puffs and beef hofan…and those spareribs you mentioned above! Now I’m craving! The pork puffs are those little pastry things with a lightly sweetened pork stuffing? If so, oo nga! Masarap yun 😀 The hofan we haven’t tried since our go to noodle dish is the e-fu. Love that mango pudding. We were scavenging the nearby tables for untouched ones; they were that good. Jamie outsmarted you guys by directly asking the waiters to deliver the unserved pudding to their table. Kaya pala wala ng inakyat sa room namin.